A Panasonic rice cooker takes the hard labour out of risotto. 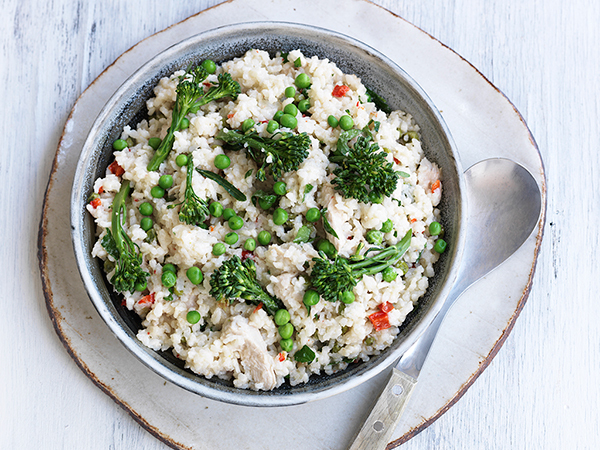 We absolutely love coming up with new ways to use our kitchen appliances and we’ve definitely hit on a winner with this chicken and vegie risotto. Instead of standing at the stove to slowly stir one ladle full of stock into the risotto at a time, you can use a Panasonic rice cooker and turn out perfect risotto in about than thirty minutes..
Set the rice cooker to cook position and place olive oil, garlic, onion, capsicum and chicken into the bowl. Fry until the onion is translucent and the chicken has browned. Add the rice and cook for 2-3 minutes ensuring that the grains are coated in the oil. Add the hot stock. Stir to combine, making sure the cook button is still down. Cook for approximately 15-20 minutes or until the rice is cooked but still has a firm bite. Add the peas and broccolini in the last 5 minutes of cooking. If it is a little dry just add a few tablespoons of water and stir. Stir in parmesan cheese, garnish with parsley and serve. Made using the Panasonic SR-ZE105 rice cooker: http://www.panasonic.com/au/consumer/household/kitchen-appliances/rice-cookers/sr-ze105.html .